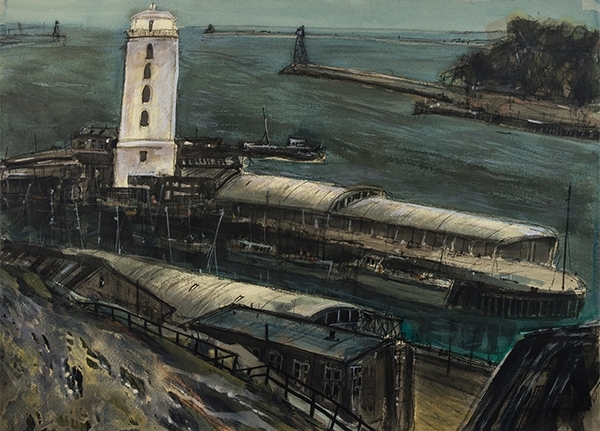 Born in 1938, James Williamson Bell spent his initial working life as a draughtsman at Swan Hunter, but eventually the need to become a full time artist took over and in 1974 he left the shipyards. Working initially with wildlife, Bell built a strong reputation amongst his peers at the Society of Wildlife Artists, leading to commissions, awards and exhibitions all over the world. In later years he visited China and South Africa, and has also carrried out commissions for the Sultan of Oman. With a restless, eclectic application to his skills and constant experimentation with techniques and styles, Bell mastered almost all forms of printmaking, thoughtfully using each method to express his exact intention for a particular project. The shipyards provided a rich source of visual imagery over the years, and the black industrial solidity of the River Tyne lends itself perfectly to another of his passions, Chinese brush painting. James Williamson Bell sadly passed away in January 2010.